Last week I came back from a short, last minute trip to Yosemite National Park. Â I went up for two nights and two and a half days. Â When I first passed the tunnel (there’s a long tunnel just before you get there) and looked onto the valley, it’s kinda like I couldn’t believe my eyes. Â Everything is so *massive* you can’t take it all in at once.. You literally need to move your head up, down, left to right to see it… And then you do it all again, because it’s that breathtaking. I brought my camping gear for the little sleep I would get, and more importantly I had all my camera gear. Â I shot 16gb worth of photo’s and have some shots that I’m very happy with. Â I’m still in going through them, but I’ll start posting them here as I upload them. For this trip I rented two lenses from Lens Rentals for the first time. Â I’ve read and heard good things about their service, and they were great! Â They shipped promptly, it was well packed and the intructions were very clear. Â I had my lenses in time and they start the clock ticking the day after youÂ receiveÂ the lenses. Â It was much cheaper to rent from them then renting say locally through Samy’s. Â My only trouble now is figuring out which lens I’m going to buy! 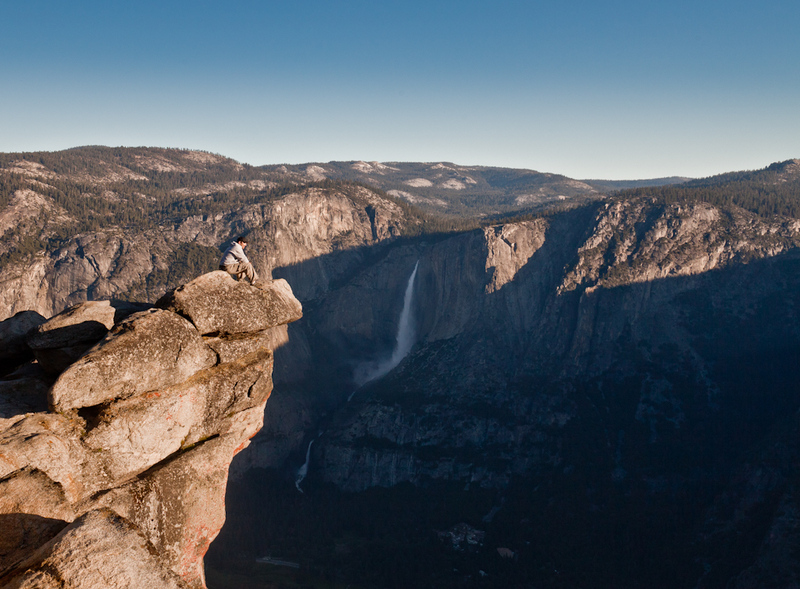 In the mean time, have a look at my first published photo of Yosemite. Â This is me, at Glacier Point at dawn. Â It was cold, high, and magnificent! Â Enjoy.